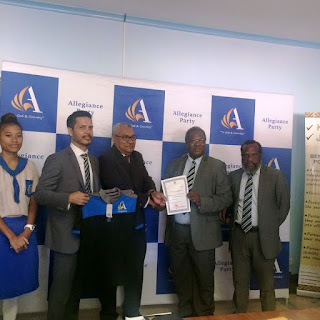 The Allegiance Party is now an officially recognised political party in PNG following the presentation of its certificate today by the Registrar of Political Parties Dr Alphonse Gelu. The Party formally know as Papua New Constitutional Democratic Party (PNGCDP) was established in 2010 by Sir Ila Geno who is the current Party President and other like minded individuals. After the 2017 National Election, some members from Opposition came together to form the Alliance Party replacing the old name PNGCDP, however the registration did not eventuate when other Parties and even supporters questioned the similarities between the other existing parties and the Alliance. The Integrity of Political Parties and the Candidates Commission then approved for the change of the name on the 15th of March 2018, allowing presentation of the certificate to take place today. Party Leader and Member Madang Bryan Kramer said the Allegiance simply means loyalty and the Party will stand by it motto which is to remain loyal to the country and to the people. “As a Party, we will come under one single political agenda and that is to bring down corruption in PNG and to ensure better future for the next generation” said Kramer. The total number of registered political parties in the country is 45, however only 21 Political Parties make up the 10th Parliament and with the inclusion of the Allegiance, 22 Political Parties now make up the 10th Parliament. Kramer revealed that over 7000 people have expressed their interest to be members of the Allegiance and they have registered on line. Following the presentation today, the Party will formally register their members who will also contribute financially and they hope to reach 10,000 members by the end of June.